A second look at Mechanical Keyboard Design. Roccat’s Titan Tactile switches are an absolute joy to type on. Every key press cements itself down into place firmly, with only the subtlest of clicks behind it. Mechanical keyboards have been a significant part of the PC Gamer’s toolkit for the last seven years, and with good reason. Those simple rectangles laden with the once synonymous Cherry switches, provided those who delved into the pricey spectrum with a feeling unlike any that a membrane or chiclet keyboard could produce. The responsiveness, and the immediate and tactile nature exuded by those linear switches is second to none. Since those early days, we’ve seen refinement, upon refinement, upon refinement. So much so that the question has to be asked as to just exactly where do you go from here? How do you stand out, in such a crowded market? It’s a tough one, but Roccat believes it may have the answer. The German manufacturer, known for its budget-oriented headsets, keyboards and mice, has typically not been a face in the premium frontier of pc gaming peripherals. Its keyboards, although touting some fantastic featuresets and packing a whole plethora of Cherry switches, often lacked the design flair, and premium material use of some of its more prestigious competitors. It always seemed to cater more towards the would-be, younger gamer, than that of someone truly serious about where they place their digits. The Vulcan 120, stands in stark contrast to that of Roccat’s traditional offerings. It’s clean, sophisticated, and far more elegant than what we’ve seen in the past from Roccat, and, if we’re honest, for a company that’s looking to clean up its image, and lean more on that Germanic design heritage, it’s definitely a good start. The single sheet of brushed aluminum, is simple, smooth, unblemished by any obtrusive gaming insignias, or branding. 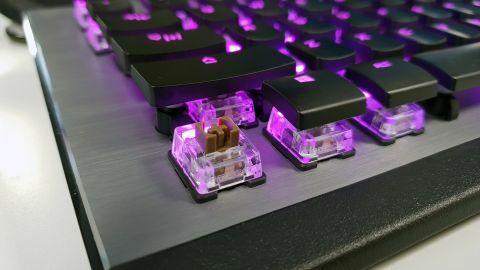 The key switches, a custom built mechanical variant, are raised, transparent, and fully lit with the now industry standard array of RGB LEDs, and although these haven’t come from the design houses of Cherry, they’re some of the better bespoke switches we’ve seen. Roccat’s Titan Tactile switches are smooth and responsive under touch, like some odd amalgamation of a Cherry MX Red and an MX Blue, all mixed in with a super low actuation point (1.8mm vs 2mm). They’re an absolute joy to type on, every key press cements itself down into place firmly, with only the subtlest of clicks behind it. It’s a subtle feeling, very subtle, yet still strong enough to let you know it’s there. On top of that, It’s quiet too, well quiet at least for a mechanical keyboard, no louder than that gaming staple, the MX Red, that’s for sure. But it’s that immediacy, and the feel that we like the most, especially in game. This is all thanks to how exactly the key switch works in conjunction with the key cap itself. As we mentioned earlier, these switches have an actuation point of 1.8mm, not exactly mind blowing, nor something we haven’t seen before from other aftermarket variants, but it’s how that works alongside the key caps that’s most interesting. In short this is all down to just how small these keycaps actually are. At their thinnest each of the Vulcan’s caps are just over 3mm thick, and at the fattest part of the cap they’re 6mm, compare that to a standard cap found on a Corsair K70, 7mm and 10mm respectively, and that’s a lot less overall plastic involved, which in turn means lighter caps. It doesn’t sound like much, but reducing the overall weight in the cap, means you have to apply slightly more pressure on each key to activate the switch (we’re talking miniscule amounts in reality). That’s bad right? Well kind of, of course for absolute immediacy you’re still going to want a linear switch (an MX Red for example), but for those who are keen typists, or who don’t rely on split nanosecond response times this makes a big difference. Each click is more forceful, and it sounds and feels better. The thicker caps suddenly feel dampened, there’s less tactile feedback from it, and the sound is almost muffled in comparison. It’s a small observation, but one that makes a remarkable difference in the overall feel of the Vulcan. On top of all that wonderful switch magic, the Vulcan also comes with integrated media keys via the function button, and additional macros if you need them, a wrist rest, a huge rubber strip along the front bottom to stop it from slipping, and two adjustable feet in the rear. There’s also a scroll knob in the top right situated next to three rubber membrane buttons: one that mutes audio, one that selects the FX lighting mode (which you can swap between RGB profiles using the aforementioned scroll knob at default, or control brightness once the desktop RGB software is installed), and one audio button, (which turns the knob into a volume control). Admittedly there’s no audio or USB passthrough, which is a bit of a blow for a flagship product like this, but you do net yourself a skinnier cable because of it. Ultimately, Roccat’s Vulcan 120 is a strong addition to Roccat’s lineup. Its uncompromising use of build materials, utilized alongside the brilliance of those key switches makes it a keyboard to look out for, and a definite contender for anyone looking to invest in a serious piece of premium finger punching luxury. As far as switches go, Roccat’s Titan Tactile, for this reviewer at least, is one of the best out there right now.